“Today you have made our impossible dream a reality,” President Yameen said at last night’s commencement ceremony, expressing “profound gratitude” to Chinese President Xi Jinping. President Abdulla Yameen and Chinese Vice Minister of Commerce Gao Yan inaugurated the landmark “China-Maldives Friendship Bridge” project last night following the signing of a contract with the CCCC Second Harbour Engineering Company. “Today you have made our impossible dream a reality,” Yameen said at the commencement ceremony, expressing “profound gratitude” to Chinese President Xi Jinping. As 2015 is the 43rd year since the establishment of Sino-Maldives diplomatic relations, “it is indeed symbolic that the most important and the most historic landmark of the Maldives will be named the China-Maldives Friendship Bridge,” he added. The Chinese government agreed to finance the bridge project during President Xi Jinping’s historic visit to the Maldives in September 2014. 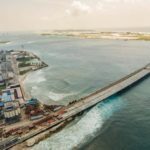 Yameen said the US$210 million bridge is essential for developing a ‘Youth City’ in the capital’s suburb Hulhumalé – both key pledges made during the 2013 presidential campaign. “The biggest challenge in our developmental process has always been the smallness and the difficulty in achieving economies of scale,” he suggested. The government plans to relocate 70 percent of the Maldives population, presently scattered across 188 islands, to the new city. The bridge along with the expansion of the international airport will “change the Maldives’ landscape,” Yameen said. The 1.39km-long and 20.3m-wide bridge will have two lanes for four-wheeled vehicles as well as separate lanes for bicycles, motorcycles, and pedestrians. 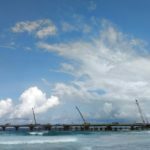 The bridge will span from Malé’s eastern edge to the western corner of the island of Hulhulé, where the airport is located. 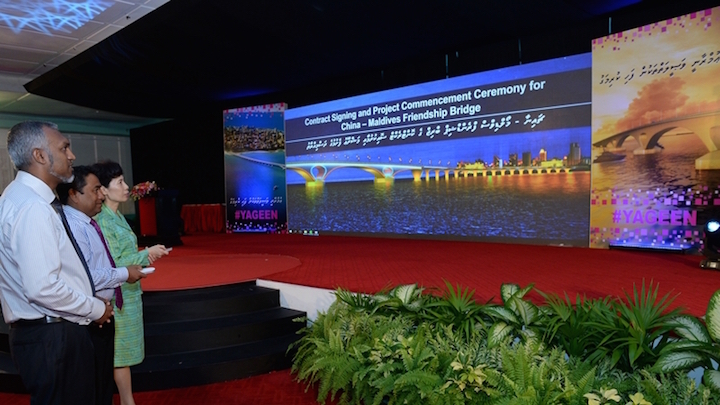 In his remarks at the ceremony, Housing Minister Dr Mohamed Muiz said the contractor will finish mobilising machinery and labour for the project by the end of February and begin work on the bridge’s foundation on March 1. 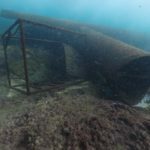 The foundation will be 70 meters or 230 feet deep, he noted, adding that the underwater work will be completed by September 8. Work on the “superstructure” of the bridge will begin on April 23, 2017. The government estimates the bridge will be completed by mid-2018. 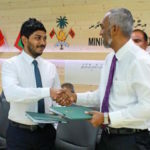 The project will be financed with US$126 million in grant aid and a concessionary loan from China along with US$12.6 million from the Maldivian state budget, Muiz said. The contractor chosen for the project, CCCC Second Harbour Engineering, was blacklisted by the World Bank over fraudulent practices during a road improvement project in the Philippines. But Muiz had previously said that the Maldivian government did not have any role in the bidding process, which was conducted by the Chinese government. “We would not like to be placed under scrutiny. But rather we would like the international community to be watchful of the misfortunes. We don’t believe that we should be placed on a treacherous slide. Tonight the Maldives is not judged without trial or served on a small platter because we are small,” he said. Yameen also made several remarks in Chinese during his speech. Yameen, whose administration has been besieged by multiple political crises, has repeatedly slammed alleged interference in domestic affairs by Western countries, especially since the imprisonment of former President Mohamed Nasheed and other politicians earlier this year. Earlier this week, the Chinese EXIM Bank granted a US$373 million loan for upgrading and developing the Ibrahim Nasir International Airport. Following last year’s high-level visits, the Maldives also became a partner in China’s maritime silk route as well as a founding member of the Chinese-led Asian Infrastructure Development Bank. 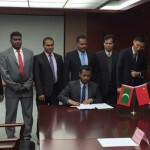 Negotiations are meanwhile underway for a China-Maldives free trade agreement.